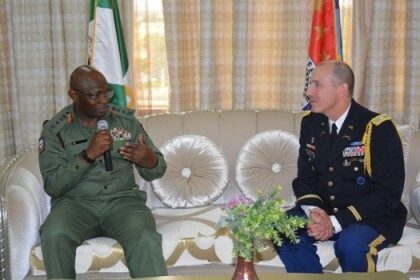 John Enenche, Abuja: The United States Defence Attaché, Colonel Patrick Doyle has reiterated that Nigeria remains one of top priority nations in the world to the United States of America insisting that the relationship between the military of both nations has grown from strength to strength. Doyle, who was on a farewell visit to the Defence Headquarters (DHQ), Abuja said since his arrival in February 2015, the Nigerian military, has been of immense help in making his stay a successful one. He particularly was full of praise for the Chief of Defence Staff (CDS), General Abayomi Gabriel Olonisakin who he said his leadership and directives to his personnel provided invaluable support in carrying out his assignment in Nigeria. Responding, the CDS who expressed pleasure at welcoming the outgoing Defence Attaché thanked him for facilitating trainings for personnel of the Nigerian Armed Forces. General Olonisakin wished Colonel Doyle the best in his future endeavors as he returns to the United States.